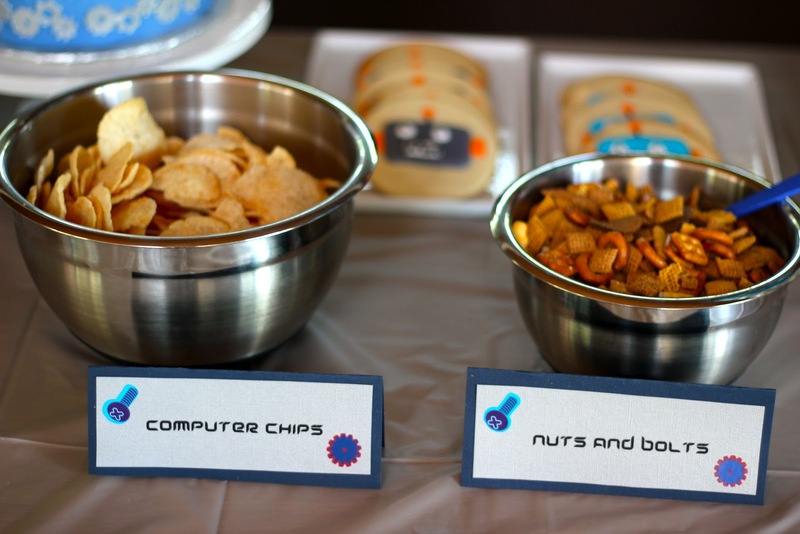 Giving in one dessert at a time. 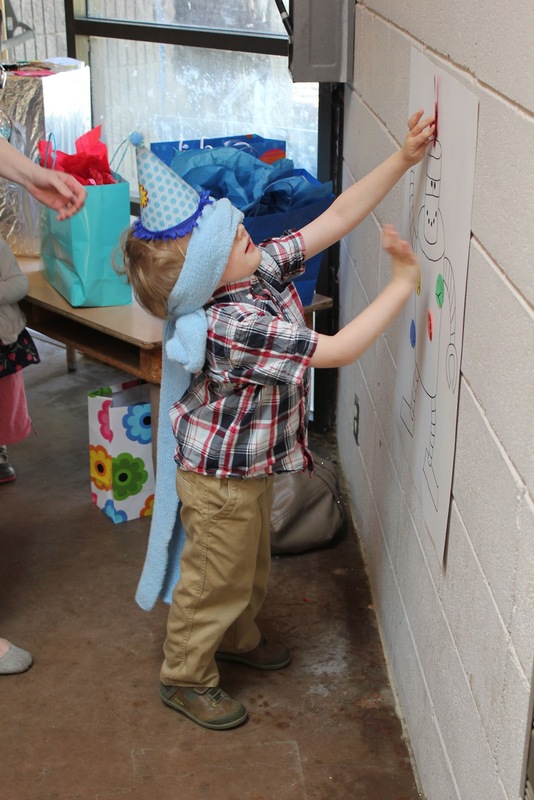 My sweet, adorable, funny little guy turned 4 this month. 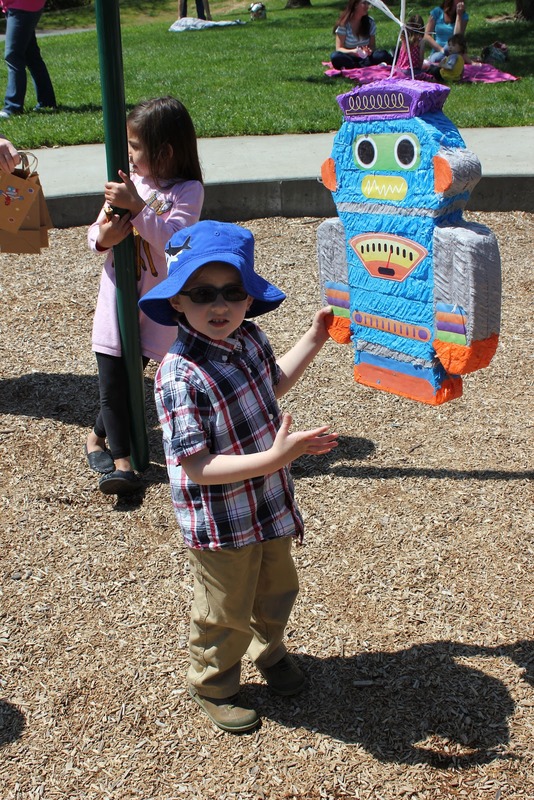 He's at the age where the anticipation of a birthday party has been building for months, and he wanted a robot birthday party. No problem! 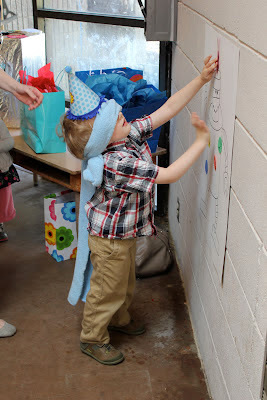 I love throwing parties, and nothing more than a kid's party. Going all out with every little detail is loads of fun for me, and even though I know he doesn't notice the half of it, I love doing it. So here it is, and thanks for looking! I made the welcome sign using a presentation board from Target. They also have these awesome black letters to use for school presentations that made my life easier since I usually cut everything out from a stencil. 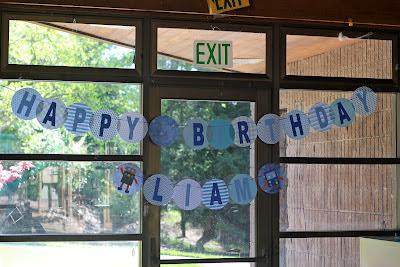 Note to husband: would love Cricut for next birthday. I made these cute party hats by covering plain party hats with coordinating scrapbook paper (just take apart one hat and use as a template to cut out the paper, then cover using a glue gun). I found the robot stickers at Michaels months ago, they had a ton of robot themed stuff in their $1 section, so if you're looking for party theme ideas it's a good place to check. I had a lot of paper scraps so I made napkin rings (yes I'm crazy). I was so happy with how his cake turned out. He wanted a small cake with cupcakes. 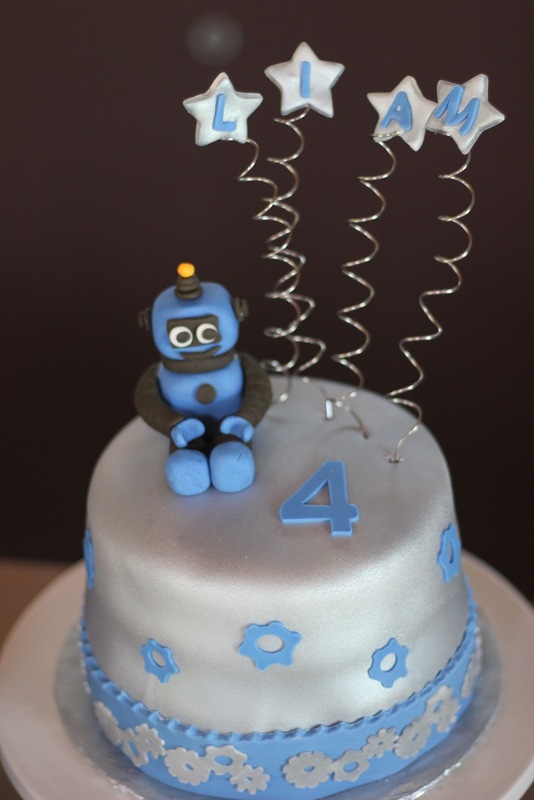 The cake was chocolate and vanilla layers, with toasted marshmallow frosting in between and chocolate malt frosting underneath the fondant. I used Duff's Cake Graffiti in silver to color the entire cake and make the stars. I was a little nervous since I read mostly awful reviews, but this stuff is all kinds of awesome. Once it dried it gave super even coverage and had a great sparkly metallic color. I also used it for some of the cupcake toppers, which were white cake with chocolate malt frosting. These were little jello jars. 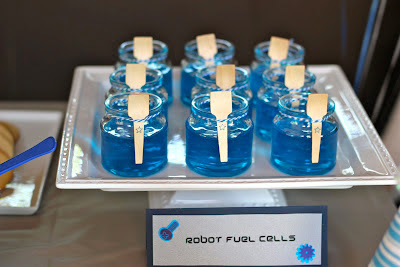 I found the spoons on Etsy, and added a little star stamp using food coloring (did I mention I was a little crazy? 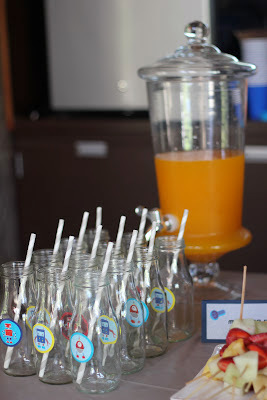 ), and then tied them onto the jars with baker's twine. I love the look of milk bottles, so rather than spend upwards of $3 per bottle, I bought Starbucks Frappacinos from the grocery store, peeled off the wrappers, and voila. I am also obsessed with striped straws, these ones (grey and white) are from Etsy. They are made of paper and while they hold up to normal drinking if you have a kid who loves to chew on straws (like my daughter) they turned in to a mushy mess quickly. 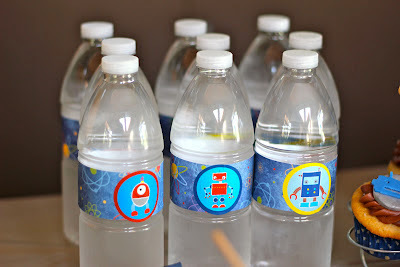 These water bottle labels were easy to make, just peel off the existing (I used Archer Farms brand from Target) and measure to cut out new ones from whatever paper you like. 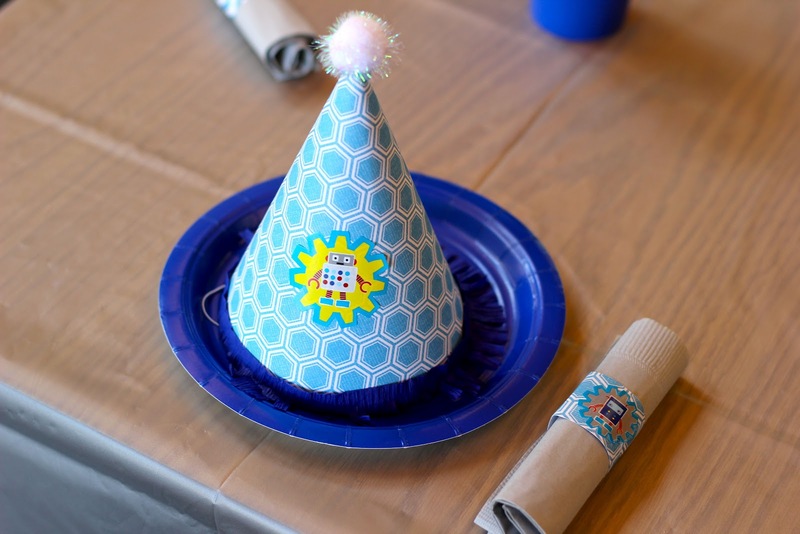 Then affix with a glue gun. 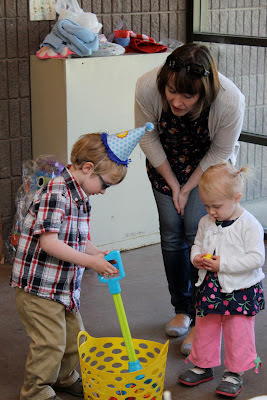 This birthday was especially fun since the kids were totally into party games and activities. 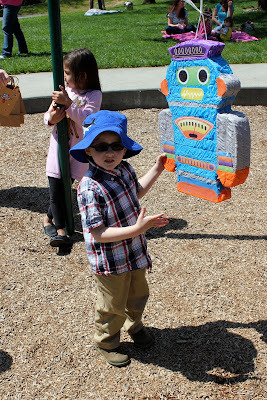 And finally we had a robot pinata (from Party City) filled with with treats. The kids loved it! You are an animal! 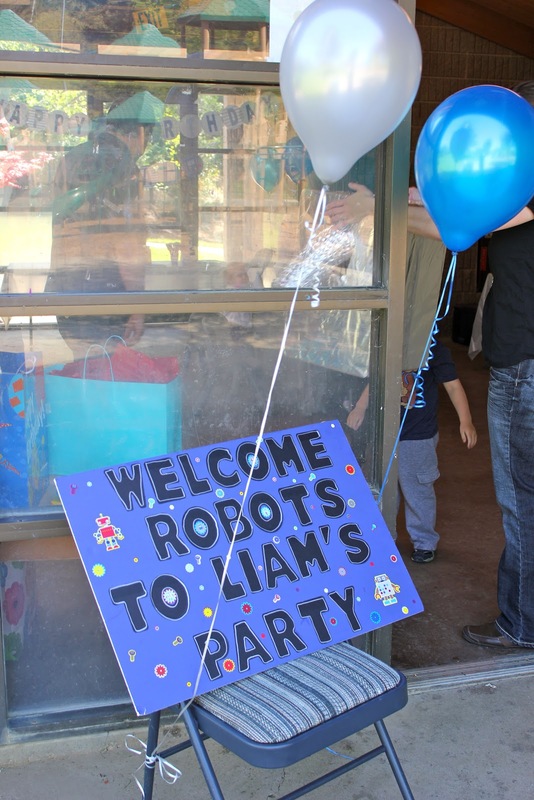 Cutest robot party ever!! You mean you made all this by yourself? Wow! 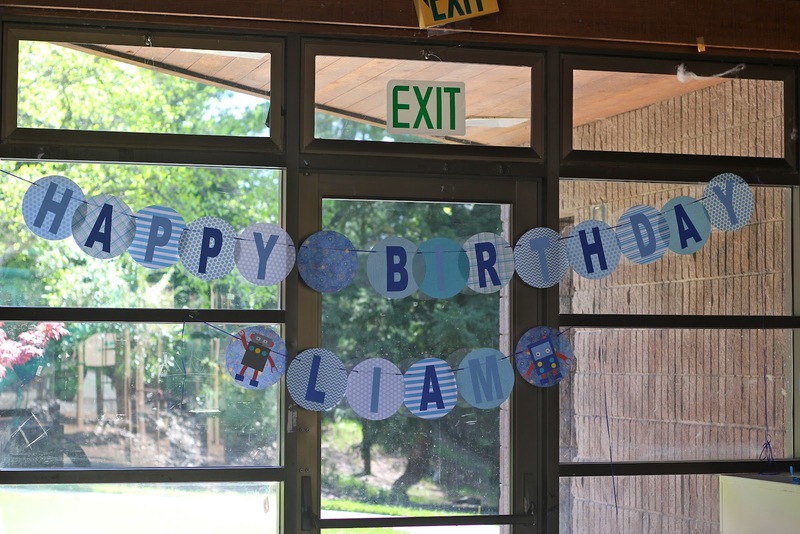 You’re such a creative birthday organizer. I like the creative presentation of the food. 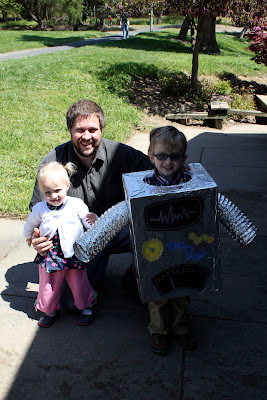 And your husband did a great job with that robot costume! 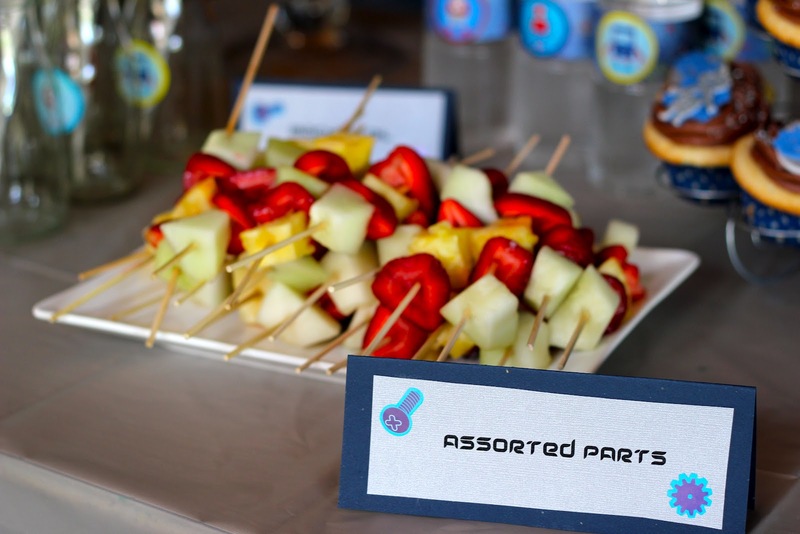 Everything is perfect! Thanks so much!! :) I had a lot of fun doing it. Great job! 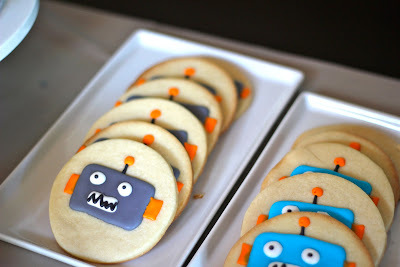 I'm doing a robot theme for my 3 year old's party and just got a lot of great ideas from this! Thank you!! Wonderful party :) Loved the robot them. How did you make the gears on the robot cake? 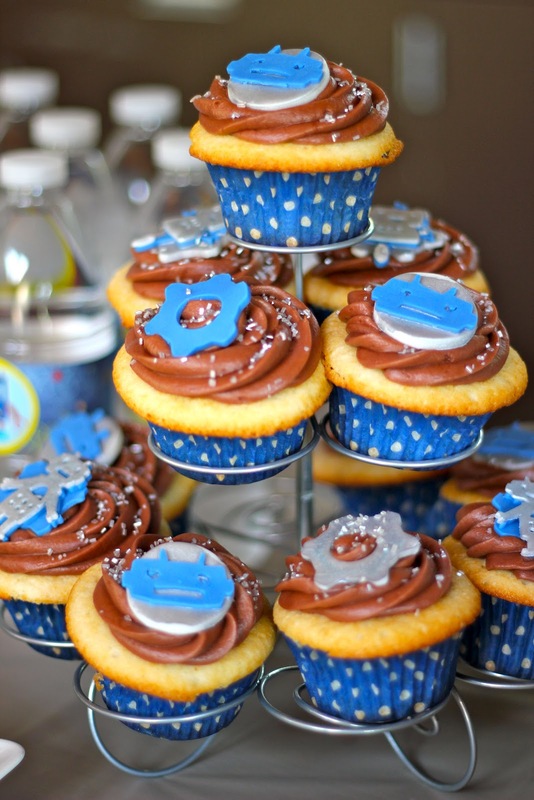 SAHM to the two sweetest things, I discovered my love of baking after years of trying to deny my sweet tooth.